One of the things you need to consider if you’re planning to redesign your website is increase its usability. Usability simply means making it easy for site visitors to find what they’re looking for, and contrary to what some believe, suability isn’t that expensive, as all it takes is a bit of research and creativity. By making the proper changes, the number of people that visit your site should increase. This represents your brand’s motto, vision and goal, and it should be on the homepage. Your tagline needs to be a single phrase and drives home the point. It probably doesn’t seem much, but it’s how you create a strong first impression among prospective clients. If your website is large, a search function will be necessary. Links and proper design layout help, but if you’re running an online retail store you can’t expect visitors to click through all those product categories. If you do add a search function, place it at the top of your website so a visitor sees it immediately. Don’t put the search box at the bottom of the page or the middle because people might miss it. Just look at popular websites and you’ll see the search box is always at the top, as it’s the most accessible part of a page. A picture speaks a thousand words, but redesigning a website is no excuse to cram it with pictures. In fact you can use this opportunity to reduce the graphics and images on the site. Remember that images serve a purpose, and that’s to convey messages. However, that message will be lost if there are too many of them. Website redesign experts often talk about making a website “scannable”, and that simply means providing easy to read content. Research shows that most people view pages in the “F” pattern, starting in a horizontal manner and down a bit, mimicking the F shape. One thing needs to be kept in mind though, and it’s that many users don’t actually read the text letter by letter, as they just scan the page, focused on the images, bold text or other areas that have been emphasized. That should give you an idea of how to arrange the website and how to grab their attention. 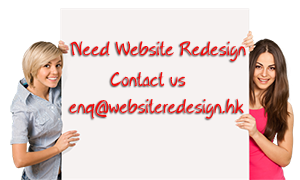 Last but not the least ensure that your redesigned website has a Contact US or feedback page. There was a time when email was enough, but now you should have links to your social media sites too. Let them know that their opinions are valued, and you can use the feedback as a gauge as to how well the redesign process went.